Thank you Jackie for taking the time to be with us. Jackie Tumwine: My name is Jackie Tumwine, I am a Ugandan lawyer with a Bachelor of Laws Degree (LLB) from Makerere University and a Post Graduate Diploma in Legal Practice. I have recently earned a Diplôme de Langue Française (DL) from Alliance Française. This rendez-vous took place during the 2002 national tobacco control conference in San Francisco. I want to thank the press service of the conference and the San Francisco Tobacco Free project that made it possible. Thank you Phillip for accepting our rendez-vous. May I ask you to introduce yourself? Phillip Karugaba: I am the spokeperson for TEAN, The Environmental Action Network, a public interest group that was created in 2000 in Kampala. 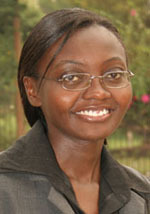 I am an attorney with an independent practice and a law professor at Makerere University in Kampala.